Where I live in Edinburgh I am fortunate enough to have a very large green space right outside my front door (to those of you who are also from Edinburgh I am of course referring to the Meadows). What’s less nice is that the pitch-and-putt golf-course on the Meadows, which is the oldest golf-course in Europe, is hilly because it was built on the mounds of plague victims that were buried there in the late 17th century. Or at least, that’s what I’ve been told. More to the point, just around the corner from me there is a large grassy area where every spring hundreds if not thousands of beautiful daffodils spring up, cheery and the colour of butter! One afternoon I decided to make use of this, and spent some time searching through the blooms until I found one set a little apart from the rest to take a photograph of. 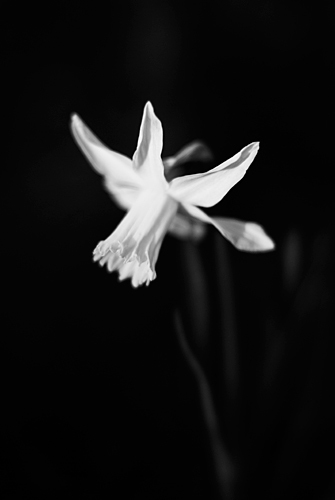 I didn’t expect daffodils to look quite so good in Black and White, but I suppose that they are a very high contrast subject so it does make a reasonable amount of sense. Nikon D80, 50mm f1.4, Hoya Circular Polarising Filter.